After moving to Miami, I met Marra Chinn Allen of Sweet Sundays Baking Co. through a mutual friend. Right away, I could tell she was passionate about her cause and we connected on our shared interest for healthy eating. 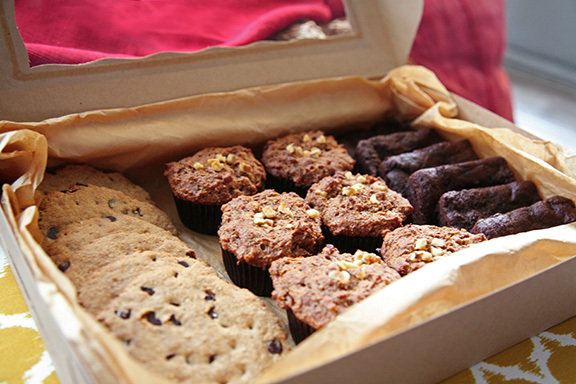 Her vegan, gluten-free, paleo friendly cookies and muffins are baked with love in Miami, FL. Check out our interview to learn more about Marra and her baked goods! Marra Chinn Allen, Founder of Sweet Sundays Baking Co.
Interview with Marra Chinn Allen of Sweet Sundays Baking Co.
Carolina Sánchez: Before baking you worked in branding and graphic design for 15 years. So how did you get started baking? Marra Chinn Allen: I’d always been in the kitchen, which started at a young age helping my mom make custom cakes or shadowing my dad who was an amazing cook! Whipping up dishes from scratch soothes me, so when I changed my diet to exclude refined sugars, gluten and dairy, I made it a mission to craft allergen-friendly desserts I could eat that taste great. I made the transition from branding to full-time baking after the company I worked for downsized. I realized the opportunity to pursue my passion of crafting refined sugar-free desserts for the local community—people just like me who struggle with some sort of allergy or sensitivity and want to satisfy their sweet tooth. CS: Where did the name Sweet Sunday Baking Co. come from? MC: I wanted a name that felt homey, like family get-togethers on a beautiful Sunday afternoon where food and sweets are a must. What we offer is small-batch artisanal recipes, created with love and peace of mind for those who want to feel normal by simply finding a gluten-free, vegan dessert they can eat and enjoy. CS: How long did it take you to develop the perfect cookie, brownie, and muffin? MC: The recipes took about a year to formulate. It ended up being more complex than I would have thought. I had a lot to learn about gluten-free baking and when you remove dairy and refined sugars, the process became even more challenging. It was worth the time and repeated testing (on anyone and everyone who was willing to try)! CS: Your flavors are really unique. Tell us, where did you get the inspiration for your flavors? MC: The Plantain-nut Muffin is completely inspired by South Florida and its Caribbean-Hispanic culture. I wanted to embrace the natural sweetness of the yellow plantain, a sister to the traditional banana. I’m always looking for a way to offer something a little different than what’s expected. The plantain, to me, is the sexier banana sister. Similarly, the Cocoa-nut Cookie was a natural way to go because raw coconut oil is great for baking plus it’s highly beneficial to our bodies. With Miami being an exotic destination, my focus turned into “how can I develop a memorable balance of earthiness and tropical flare?” By combining almond slivers, chunks of pure cocoa and rich coconut flavor, the Cocoa-nut Cookie was born! CS: The plantains are genius and definitely a new twist on traditional banana flavored baked goods. Tell us about the uniqueness of your products. MC: Our products are all gluten free, vegan (dairy and egg free), peanut free, corn free, soy free and refined sugar free. We also don’t use white rice or brown rice, which is common in many gluten-free products. In addition, our cookies are paleo. At the present time, 90% of our ingredients are organic and the rest are from non-GMO sources to provide the healthiest dessert options for our consumers. CS: That's fantastic. It's not easy to find all of those things in one product. Where can customers buy your baked goods? MC: You can order online at sweetsundaysbaking.com, and we’ll either ship or deliver directly to you. We also offer free pick up from Via Verdi Restaurant in Miami’s MiMo neighborhood in the Upper East Side. In addition, our products are sold at some local retailers, including GreenLife Miami, an organic café in Coral Gables, and Kaplan Chiropractic in South Beach. Our goal is to partner with more local retailers aligned with our vision, so customers have more options when it comes to buying allergy- and diet-friendly desserts. CS: What are some projects you hope to do/have planned in the future? MC: We currently operate out of a local Italian restaurant (Via Verdi), and while we don’t presently sell from this location, our goal is to do a pop up shop a few days a week in the near future. The restaurant has a charming Bottega located adjacent to the outdoor dining area. There, we plan to sell our freshly baked gluten-free desserts. To learn more about Sweet Sundays Baking Co. or order your own box of goodies, visit http://sweetsundaysbaking.com/ or call 305-749-5458.